Few circumstances develop the way we would expect. For Val McClatchey of Indian Lake, Pa., a simple interest in a certain make of automobile has led to a number of twists in her life's path she could never have anticipated a decade ago. As a real estate agent and member of the North Eastern Ohio Camaro Club in August 2001, she replaced a series of disposable cameras with a digital camera for snapping images at car shows. Less than a month later, that camera happened to be sitting by her front door when a plane crashed in a field not far from her home. Acting on instinct more than conscious thought, she grabbed the camera, ran onto the porch and snapped a photo. That photo was the first picture to be taken of the crash of Flight 93, a photo that permanently altered her life. 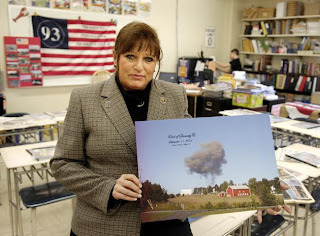 Val McClatchey shows a copy of the photo she took of the smoke from the crash of Flight 93 from her front porch in Indian Lake, Pa. McClatchey came to Chardon Middle School Friday to share her 9/11 experiences with the students. A decade later, the NEOCC connection came full circle for McClatchey. A fellow club member had seen a public notice asking for memories of the Sept. 11 tragedies from those with local connections. 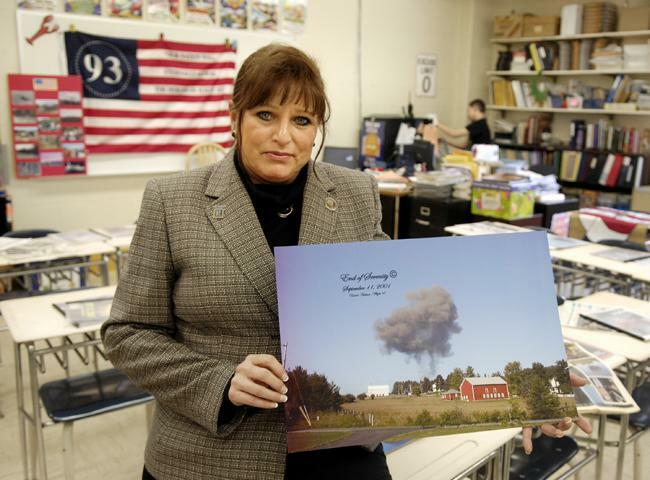 That club member told McClatchey, who then contacted Tim Bowens, a Chardon Middle School teacher with a long history of working to keep the Flight 93 memories alive. McClatchey visited the school Friday to share her experiences and the now-famous photo with sixth-graders working on an oral history project. She thought she had become numb to the experiences of that day through a decade of retelling them, but found that sharing them with a pair of Chardon sixth-graders helped bring the experiences back to her in a fresh way. The interviews were captured on video and will be combined with live portrayals and readings by students in a special presentation at Geauga Theater in May, said Kristan Rothman of Young Audiences. In June, Bowens' students will make the annual sixth-grade pilgrimage to Pennsylvania, to the Flight 93 memorial. "I'll be there to greet them in Shanksville," McClatchey said. The reporter should have said why Val's camera "happened" to be sitting by her front door; she was supposedly anticipating a helicopter fly-over the morning of 9/11. under the eave of that barn, and compare that with val photo.